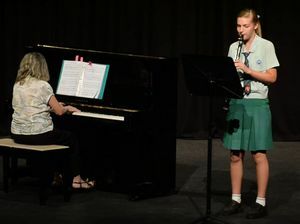 Daughters of J, Hannah Walsh and Gabrielle Keating won St Ursulas College Dunbar Family Trophy in the talent quest. Music WHEN Gabrielle Keating hears her neighbour Hannah Walsh singing in the shower she belts out a tune back to her. News WHEN Gabrielle Keating hears her neighbour Hannah Walsh singing in the shower she belts out a tune back to her.